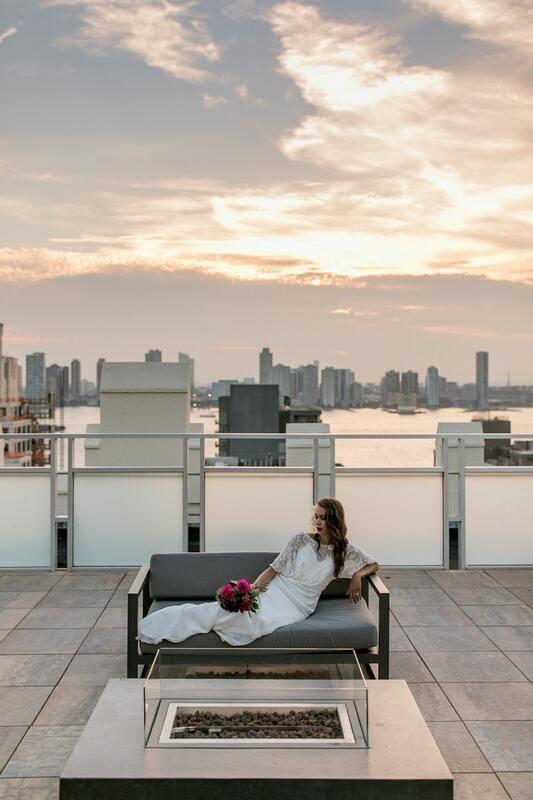 The Tribeca Rooftop added a modern touch to this Gatsby inspired shoot. A glittery gold table scape and jewel toned florals were a lavish touch to a modern setting, with the NYC skyline in the background. Our Cora gown was accented with feathers in the hair and a dramatic beauty look for ultimate 1920's glamour. And how amazing would it be to experience the sunset over NYC on your wedding day? This vibrant styled shoot, inspired by the artwork of Frida Kahlo, sets the mood for an intimate summer wedding, despite being shot in March. 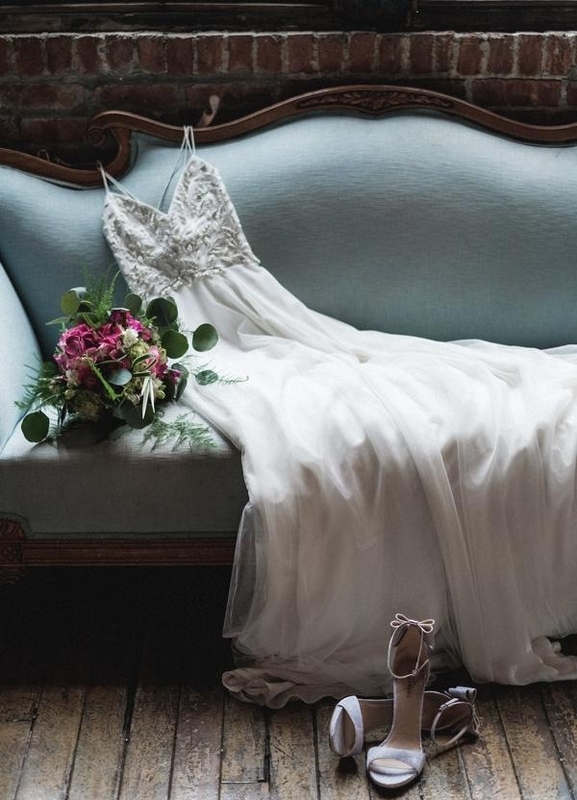 The exaggerated sleeves on the beaded silk Cora gown and the red roses in the bride's hair were an ode to Frida's bold style and bohemian glamour. Since we're based in Brooklyn, it's so great to come together with other local vendors to bring this inspiration to life. Park Slope's Palo Santo, with its exposed brick and romantic lighting, along with a custom macrame ceremony backdrop, made by BAYITH, made for a beautiful rustic setting. 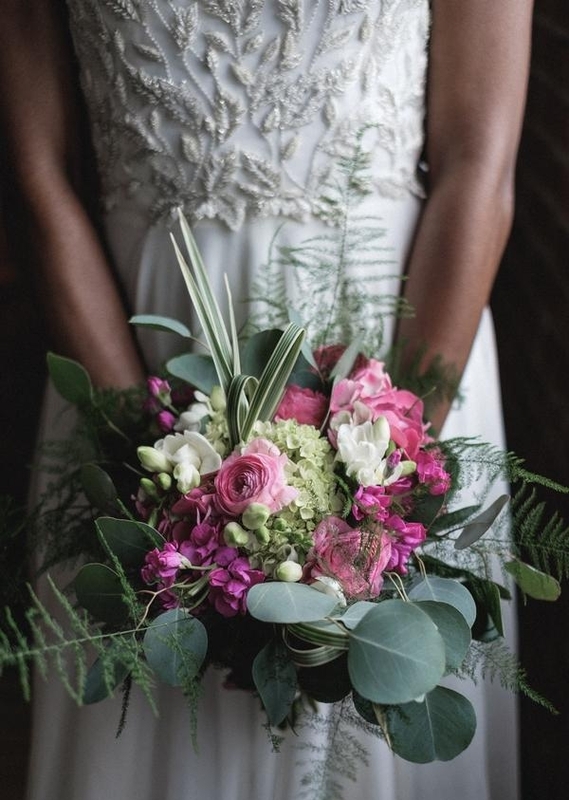 Zahlias hand picked the flowers and greenery to evoke the essence of Frida’s artwork. The vibrant florals were also the inspiration for the invitation suite and menu, designed by Passion Fruit Letterpress, and the cake, designed by A White Cake by Lauren Bohl White. Full shoot featured on Pretty My Party. One of the best things about designing bridal gowns is being able to collaborate with other wedding artists and create a unique vision for the modern bride. 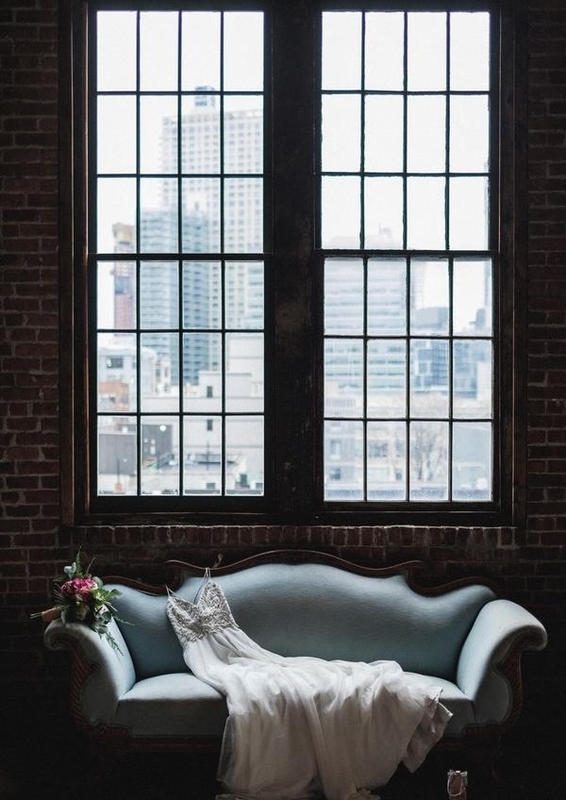 This industrial wedding shoot featuring the Silvia gown uniquely combines an airy loft space with a gorgeous rustic garden flair. This is the perfect inspiration for a city bride that wants to stay close to home but wishes she could step out into an overgrown forest. All the beautiful images are by the Edward Bell Photography. 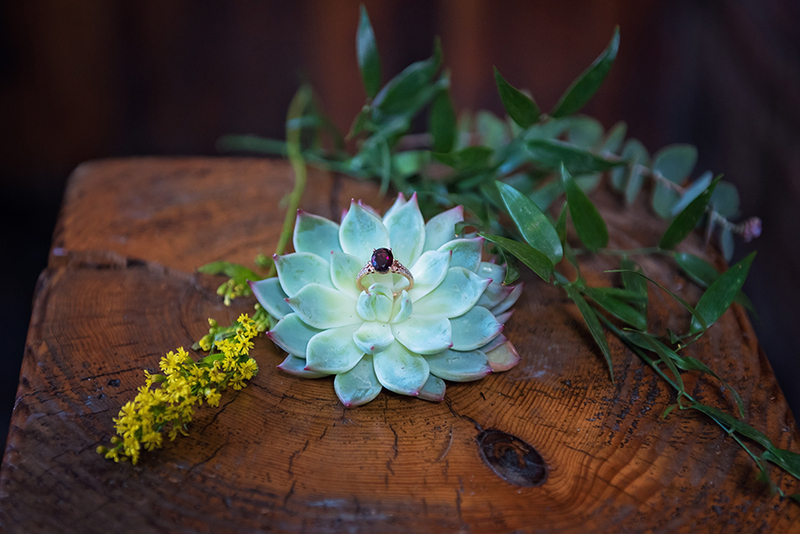 The full shoot can be viewed on Aisle Perfect http://aisleperfect.com/2017/02/industrial-wedding-styled-shoot-rustic-garden-flair.html . Every time I walk by Brooklyn Bridge Park, I'll see at least two couples taking their wedding pictures and I just can't help but stop and look. Of course there's the bridge, but there are so many walking paths and hidden nooks that make you feel like you're not even in Brooklyn. A short walk from the Carousel are cobblestone streets that line up with views of the Brooklyn Bridge for a perfectly framed photo. 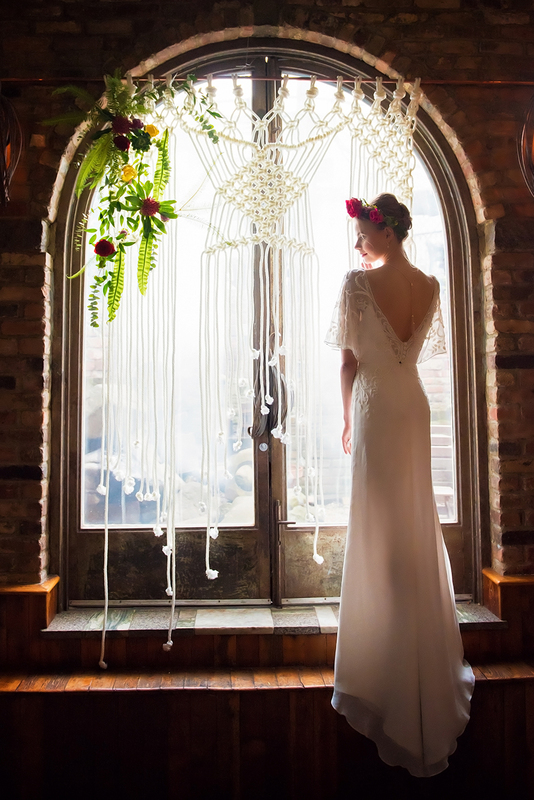 The Adine, Silvia, and Cora gowns look dreamy next to leafy backdrops and rustic brick walls. There are so many more spots to explore, I'll be back soon! Photographer: Ian Jenkins, Model: Olya Smith, Makeup: Alexandria Bagsic.